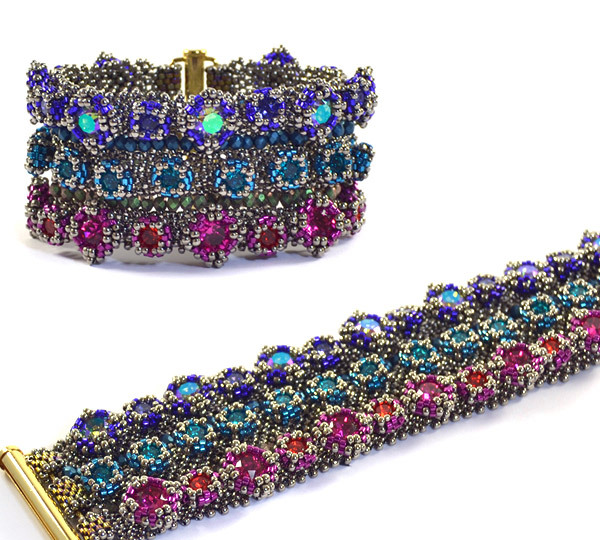 This bracelet is both fun to make and to wear! Alternating sizes and colours of chatons create rows of colour and texture. Work in cubic right angle weave making strips and embellish directly off of the strips to bezel beautiful coloured and different sized stones. TECHNIQUES: Peyote, Cubic right angle weave (CRAW) and embellishments. Students must be very familiar with these stitch techniques. REQUIREMENTS LIST: A complete requirements list/kit contents will be supplied as a downloadable PDF in each confirmation email upon registration and payment. NOTE: Students must ensure their ability matches the required skill level clearly stated in the workshop description. If a student’s ability clearly doesn’t meet the required standard, they may be asked to leave, as the tutor will not have time to teach basic listed skills individually. This would impact on other students' learning time.